Teaching the Next Generation about Making Great Soil! 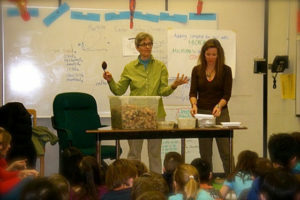 Laureen and Marcia (Eco-yards designer) spent some time teaching the Grade 4 students at Alex Munro school in Calgary how to make compost and how to design a compost bin. The students had already been studying the topic and had great questions. They took their new knowledge and built a great compost bin of their own for the school garden! Amazing!